The second hand is bent, and I will straighten that as well. 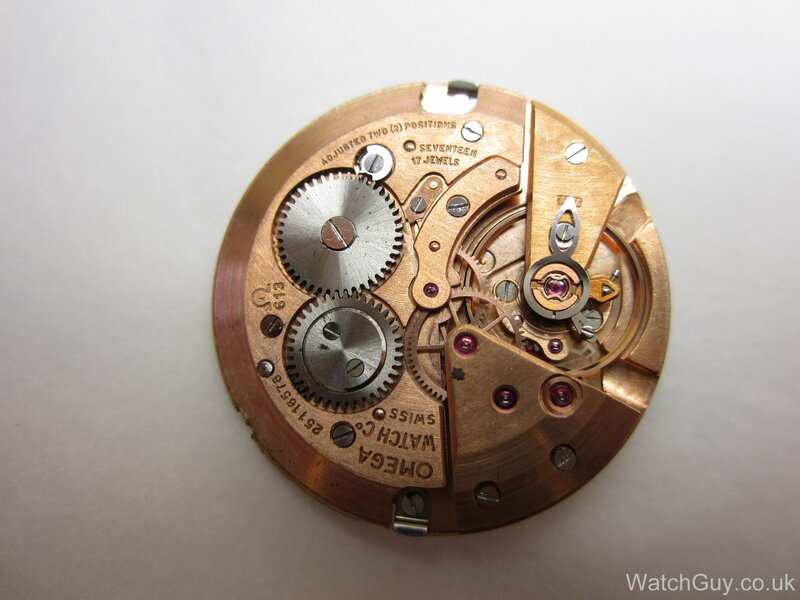 The calibre 613 movement is in good shape, just a bit dirty. You can see bits of dirt on the plate and gears. Quite a bit of dirt on the date cover as well. … and on the bottom plate. The date ring has a scratch that goes through the middle almost all the way. Now how did someone manage to inflict this? The new pendant tube for the case. And fitted. The Omega original tube was 2/100mm too thick, so I turned that off on the lathe, and now it fits perfectly. The new crown, the new split stem, and the old split stem. New crown with stem fitted. 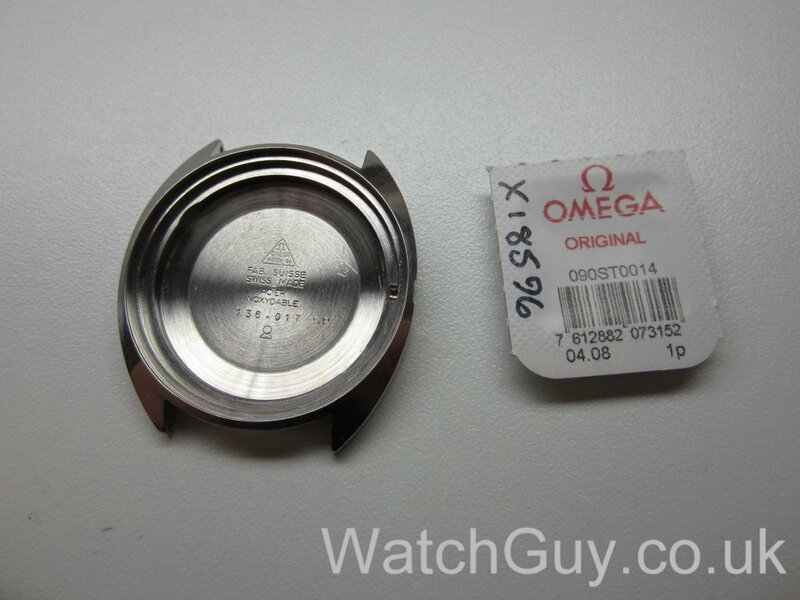 A new original Omega mainspring. Not cheap at £26! 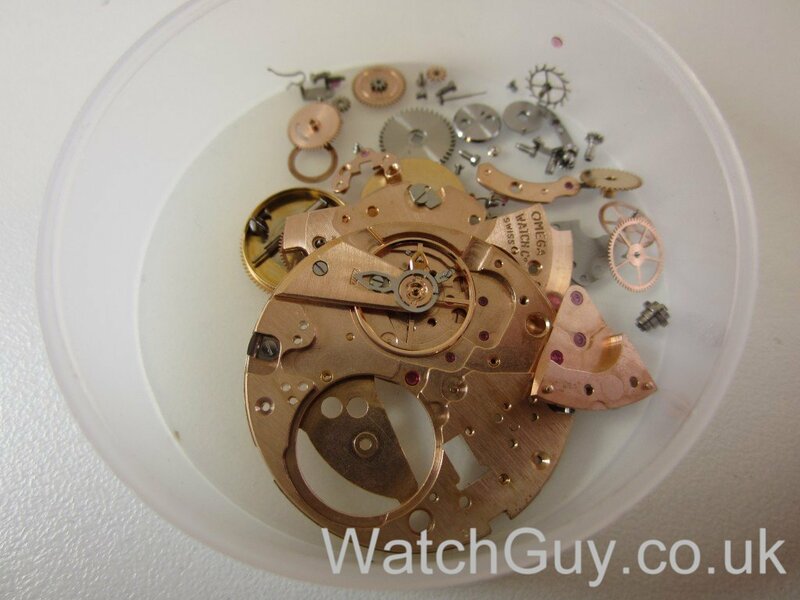 The base movement comes back together – all nice and clean now. 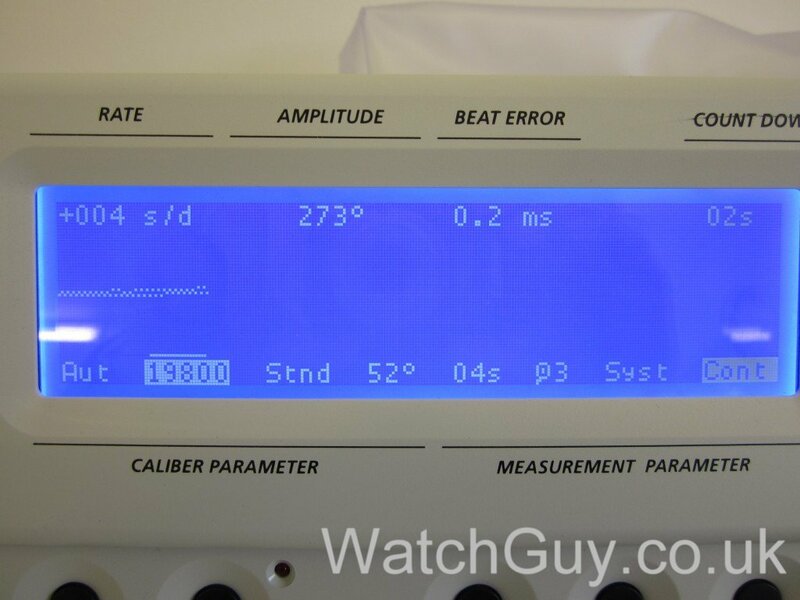 … with a nice amplitude and steady beat rate. The new date ring without scratches. And we’re back in business with a new Omega crystal. That looks better! 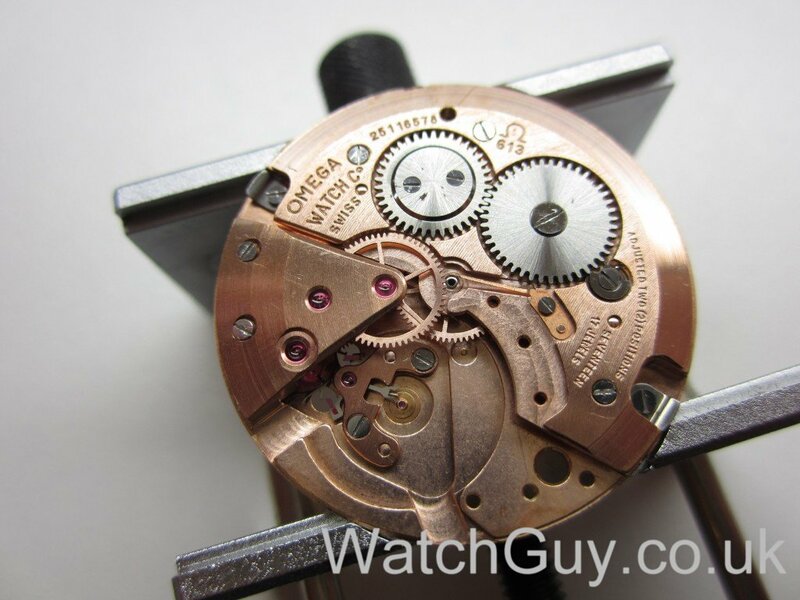 What were the part numbers of the crown and split stem for this watch?? I have similar project I’m working on with an Omega 613 movement in it. 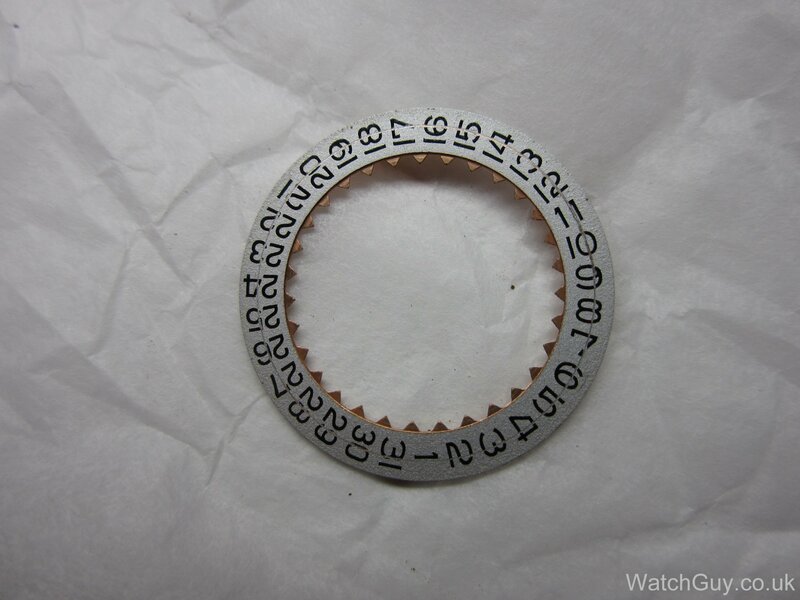 Try cousinsuk.com to look up the part numbers. Thanks for that website. Without the part numbers I’m unsure where the parts would be. 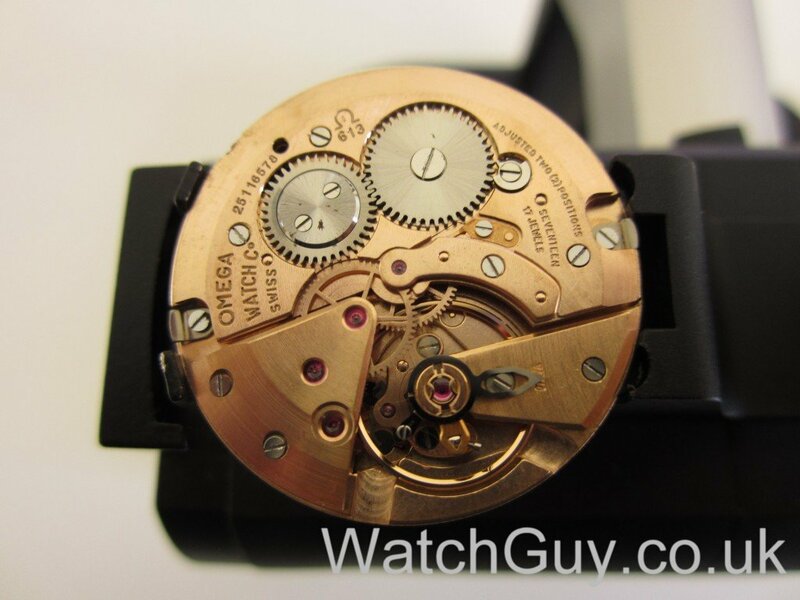 I have the same case number and movement as this watch featured here. My split stem broken and missing the crown as well. 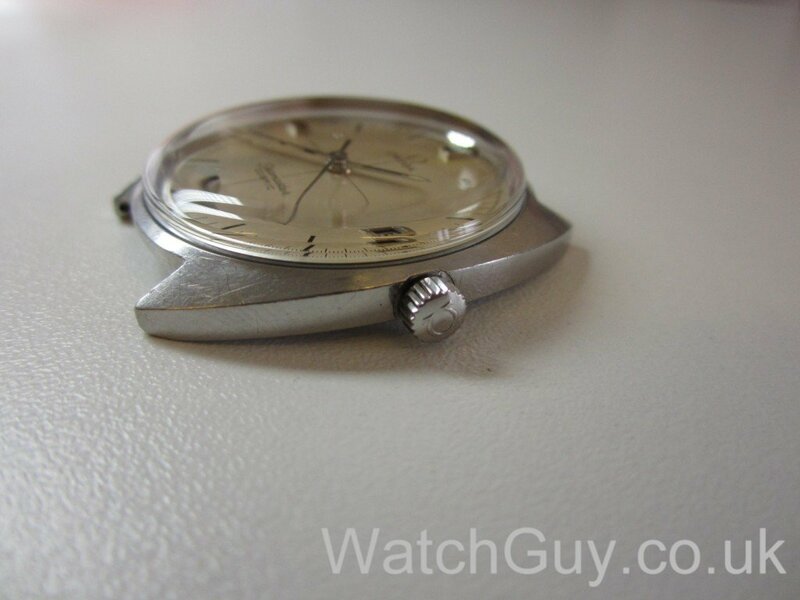 I have a Geneve from the 70s, how do I tell if the movement is 613 or 1030? my two geneves with 613 movements running v well, great to see the photos of the overhaul.. had to dispose of my cosmic automatic, as despite an overhaul ,it didn’t seem to have enough power to change date and day without slowing down…thanks for kind advice. 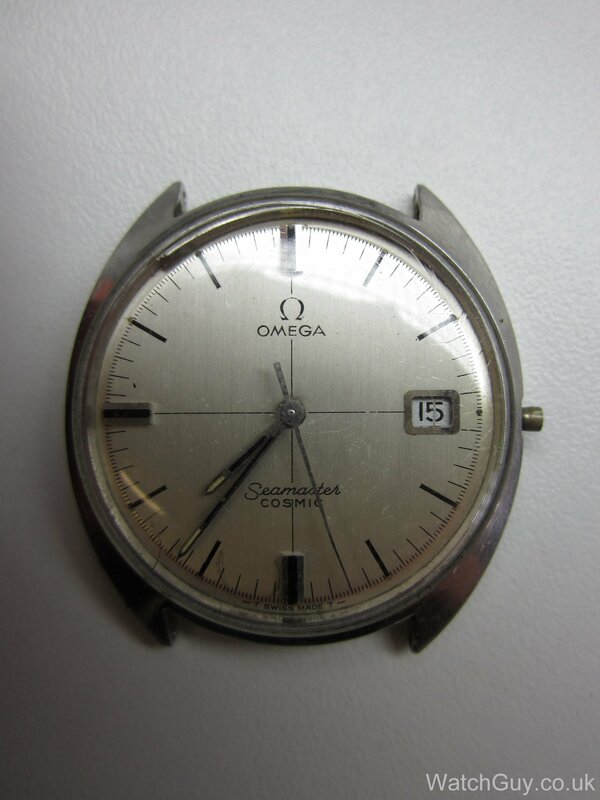 Hello, ive bought a vintage omega with 613 caliber but the crown is no originale, i would like to know how to take off stem to replace the crown without dismounting the whole caliber, if it is possible. Maybe not try that on an expensive watch? Hi! 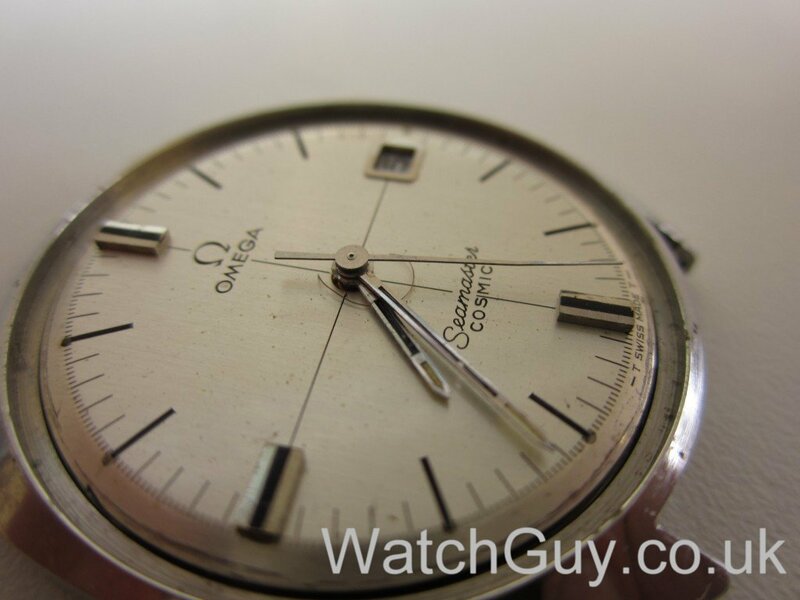 I have a Omega Seamaster Cosmic ca 1960. And the second hand has fallen off! Is this easy to repair? Sincerely, O. 🙂 It could be a damage after transportation. A ruff hit or something. Minute and hour hand is still working so i hope it’s just a matter of putting it back on the arm. 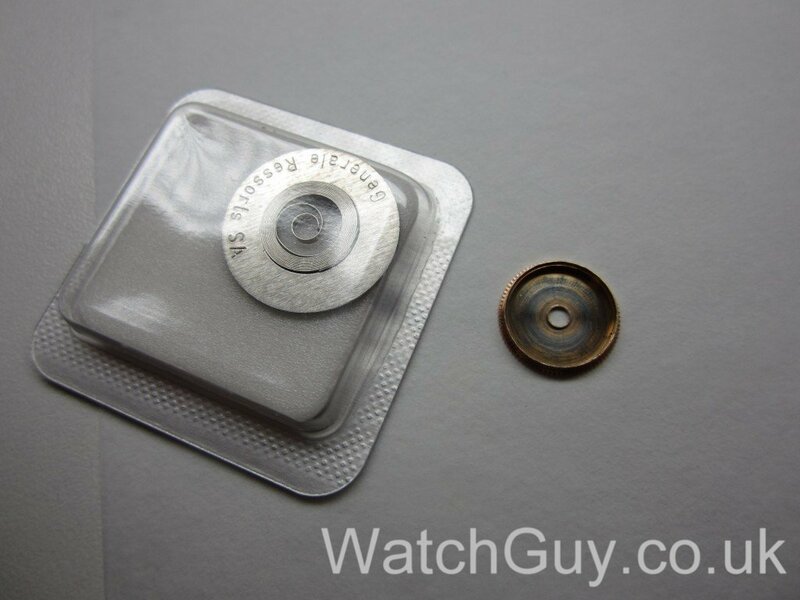 There’s been som modifications to the watch and the back has been sealed. Probably the only way to get in is to pressure “pop” the case. I’m interested in having it repaired and serviced.. Please E-mail me and I’ll send some pictures! 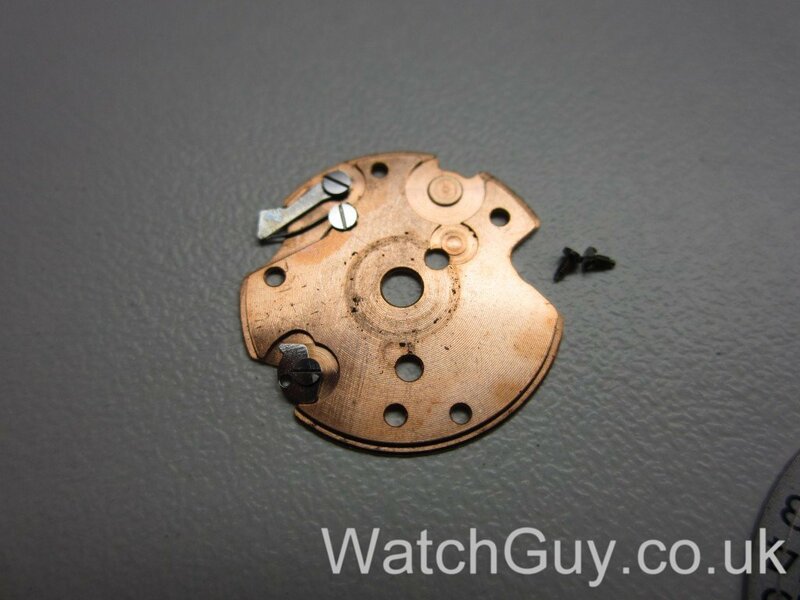 Hopefully you can help me repair the watch. 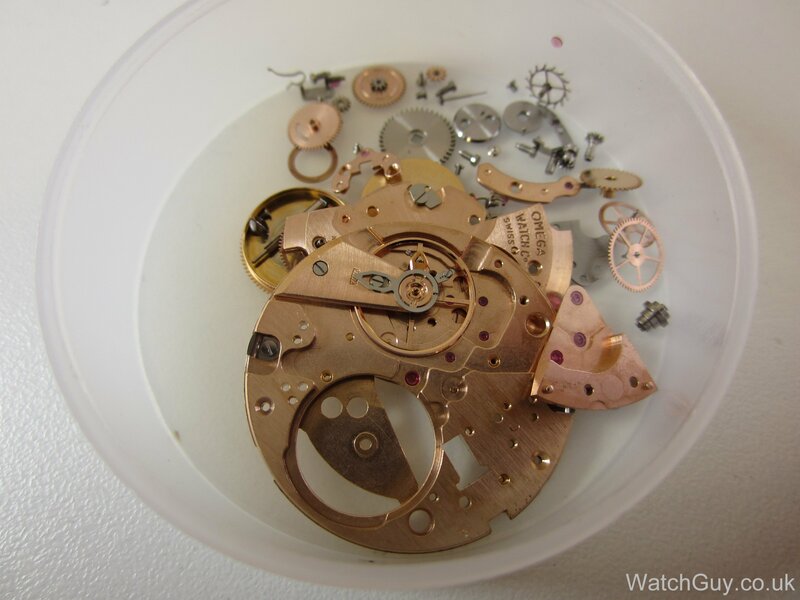 Sincerely, O.
under the counter of the very antiquated watch repairers was an identical model, unsold for a year, which works perfectly, so i bought as spare..
i have made several gummed up watches work again with horolene in small doses, so appreciate the highly skilled reassembly work.. 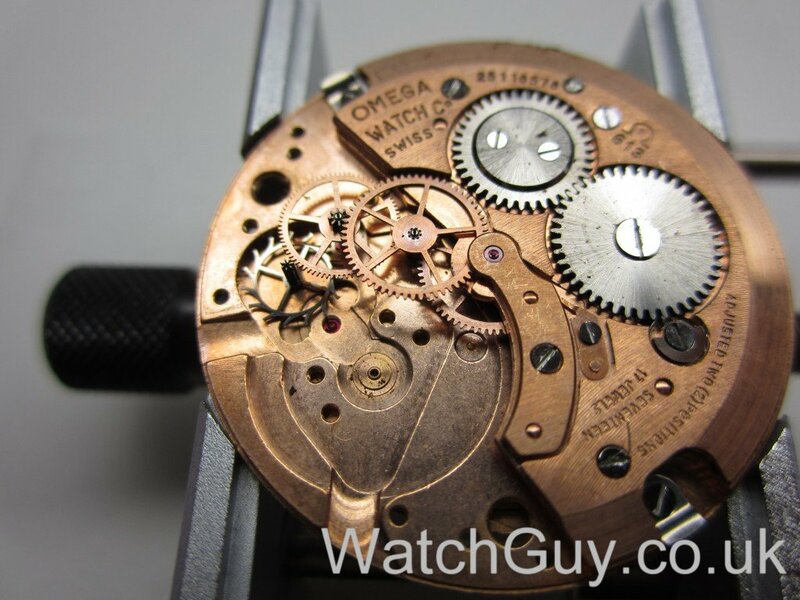 I have an omega Geneve, calibre 613, with a calendar. It has a case with a screw on back. 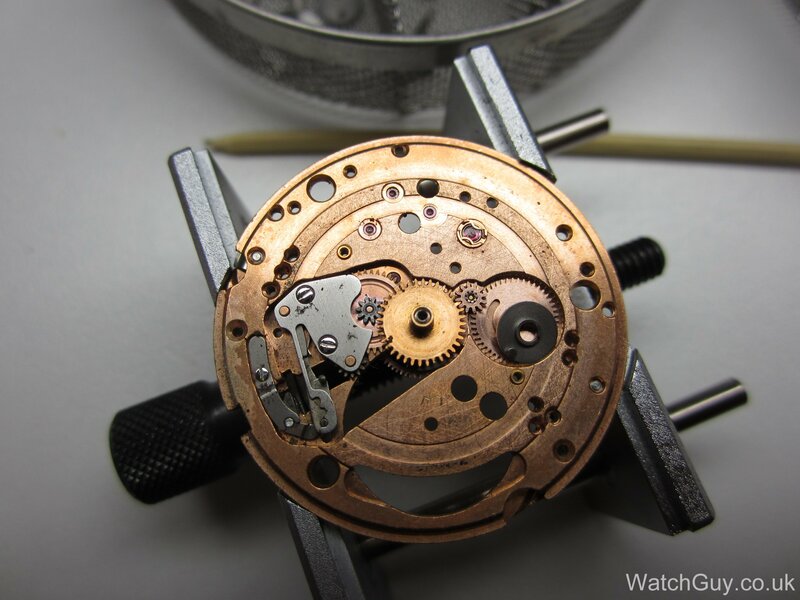 The thread on the main part of the case is corroded so that the back no longer properly seals the movement, which has been regularly serviced and is in god condition. Can the case be repaired (build up the metal and recut the thread??) or replaced? I really like your site, and the way you walk through these jobs. It provides great information about the steps involved, and also illustrates how complicated the process can be! I acquired one of these from a colleague (relatively inexpensive). It wasn’t working at all – wouldn’t run, and wouldn’t wind easily. I used the air compression method of removing the crystal, and was able to diagnose the problem (a retention clip had come loose, and was jammed in the wheel train of the rotor, causing a stripped cog). Anyway, unbeknownst to me, when I removed the movement I lost a piece…something I didn’t realize until I tried to re-case it later. The missing piece is a small spacer (wedge?) 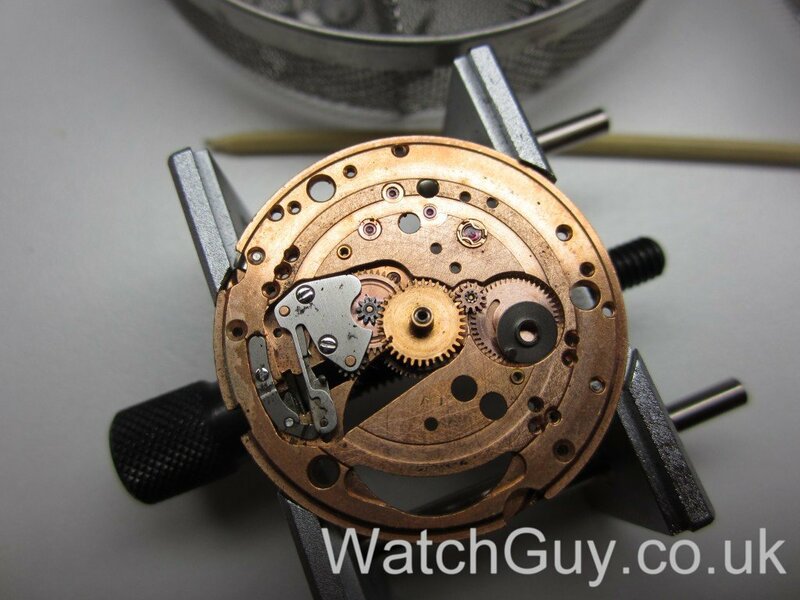 that fits over the stem, and holds the movement securely in the case. 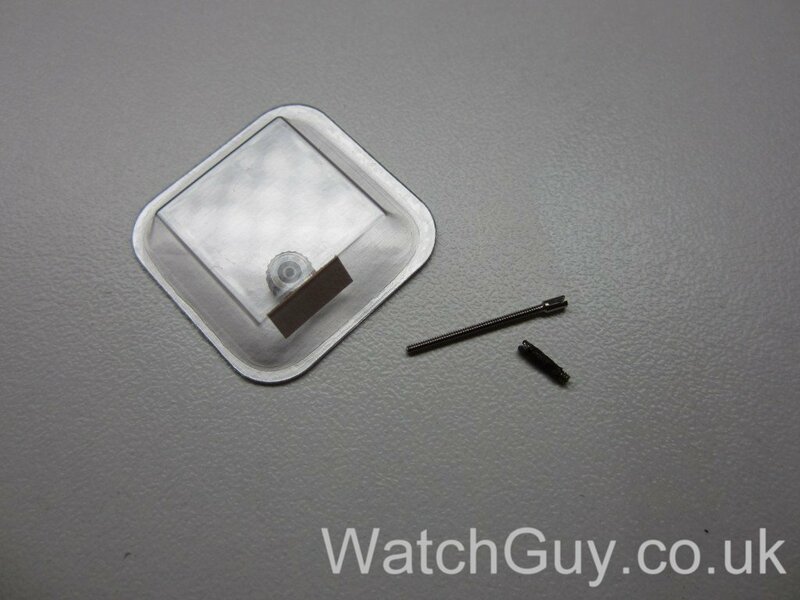 The replacement step isn’t outlined in the post above, but I wonder if the piece was present in this watch? 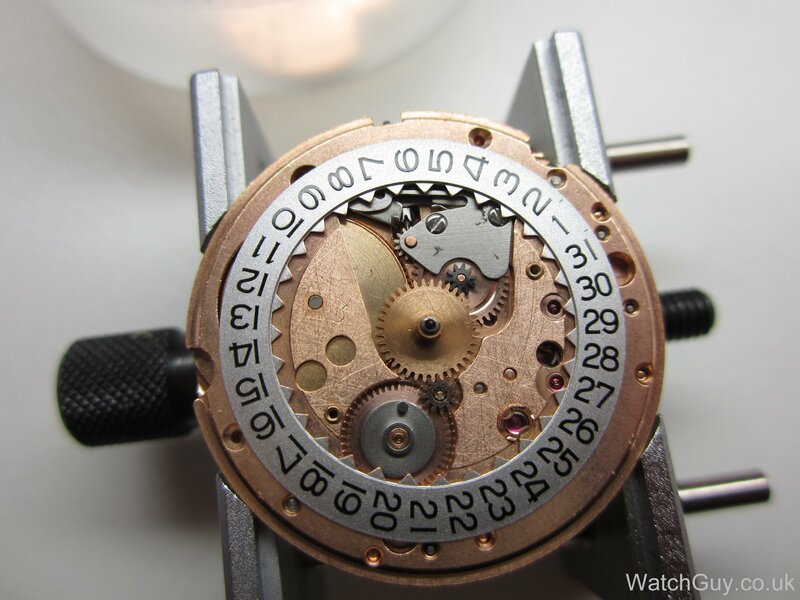 Oh, and for what it’s worth, my Cosmic is in a 166.026 case with a 565 movement. Send me an email (see contact page) with your address details, and I’ll send you the wedge. Thanks Christian! You’re quite generous…not only for this, but also for sharing all of this knowledge on your blog. I will watch the mail (as well as your site for future posts). I just found this website and I am very impressed with the all of the knowledgeable people on here, especially this particular post by Christian. 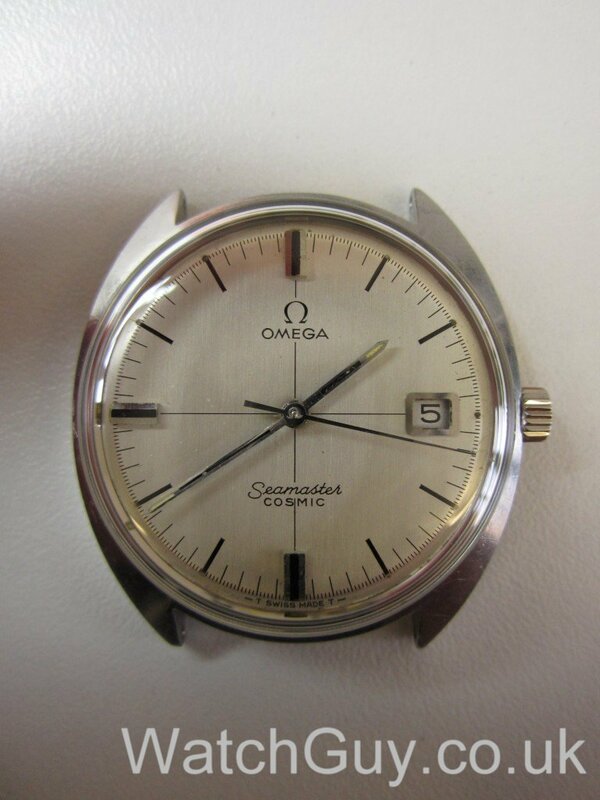 I am novice at Omegas and I wanted to ask some advice concerning a vintage Seamaster ( just like the one in this post) that I just purchased recently. I was setting the date using the “pullmatic” feature, when the crown popped out along with the stem. The stem went flying never to be seen again, so I just have the crown. 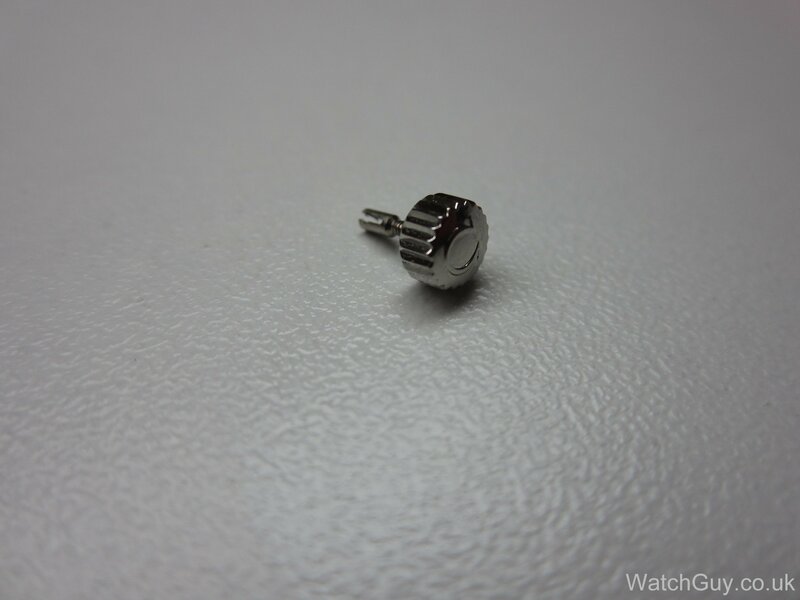 I have ordered a replacement 613 winding stem, but am unsure about fitting it properly. 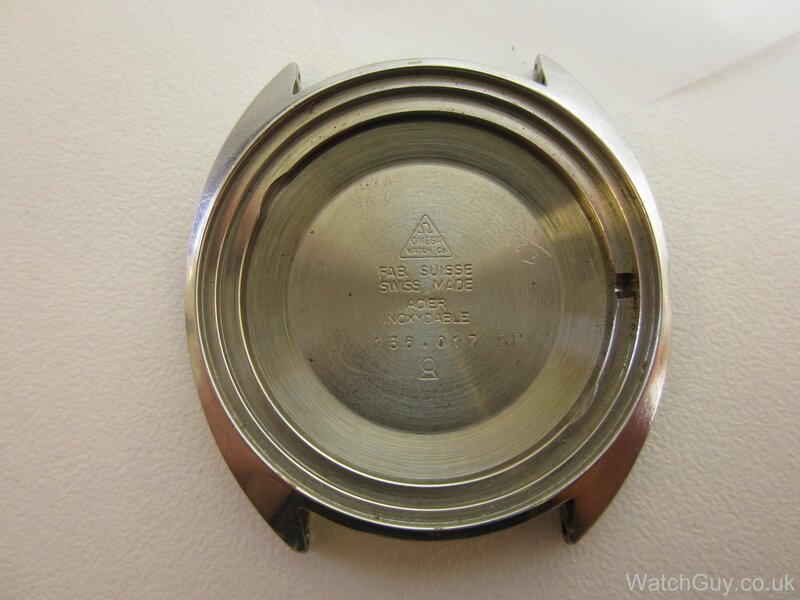 Would simply connecting it to the crown and pushing it in do the trick ? I know that to release a stem there is a spring loaded button that needs to be pressed. I probably should take this to a watch repair, but I wouldnt mind giving it a go, if it is a fairly straightforward thing. I appreciate any advice you could provide. This watch has a split winding stem, so you probably didn’t lose any part. Check out your crown – it should have a female split stem connection, and the male part is on the movement. Check out the position of the male end, and push the crown with the female stem back in. Many thanks for your prompt answer. When the crown and the stem came out, I fumbled with it and it was gone. It was miniscule. I searched for it but to no avail. You are right, the crown does indeed have a split stem female connection. I expect that the 613 cal winding stem I ordered should fit nicely. Thank you so much for the advice! You can order either a complete stem (for the same movement in another case), or the outer part of the split stem. The complete stem won’t fit your watch. Also, check the crown thread to make sure it’s ok. I am going to weigh my options and if I can´t manage to find anyone around here (Spain) to do the job I just may send it out to you. Hi, the date ring could have been damaged by the rivet on the back of the dial. The riveted back of the 6 9 or 12 o’clock markers. Hope this helps. Andy. First and foremost, I want to thank Christian for taking the time to painstakingly photograph and explain his work no matter how big or small the task. 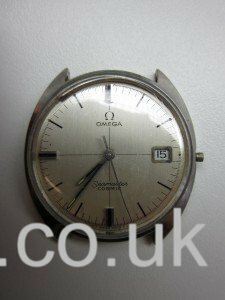 In fact, it was his work on 2 previous Seamaster Cosmic timepieces that pushed me to get in touch with him just after the Christmas holidays for the wristwatch you see in these pages. It was only back in August that while on holiday in the North of Greece i stumbled upon a small watchmaker’s shop. When I asked him if he had any old Omegas for sale, he showed me this slightly tired looking yet complete Cosmic (it also came with the original steel bracelet and clasp). Unfortunately at the time, my knowledge on this quirky timepiece was limited so i failed to notice a few tell-tale signs that should have had me walking out immediately. Despite having an incorrect non-original crystal and a slightly bent crown, the guy behind the counter reassured me that the watch was fully serviced and that I had a 1 year warranty. My hunger for a vintage Seamaster managed to cloud my sense of logic, and I found myself the proud owner of what I thought to be a great bargain! 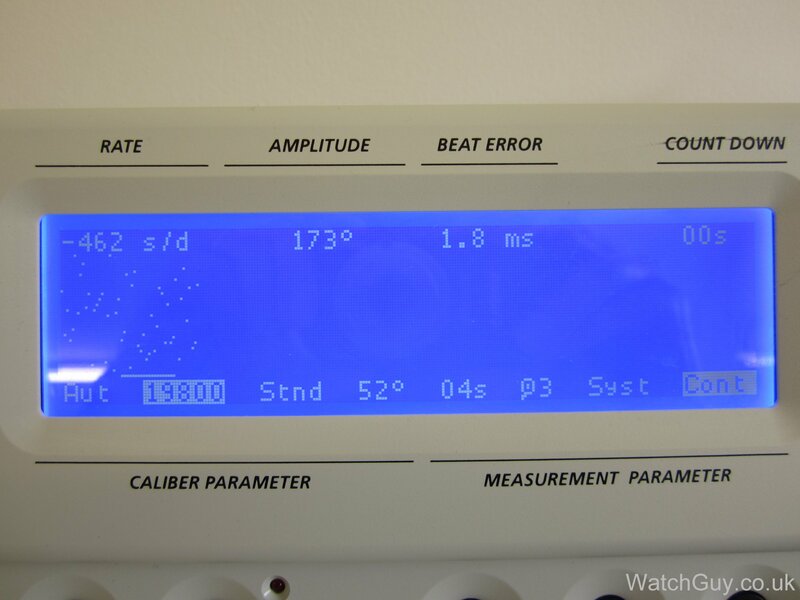 However, it was only a few days later when I tried to change the time that the crown fell off. As i was already back in Germany, it was going to be quite difficult to claim back my money or even make good on the watchmaker’s warranty! I tried a couple of other watchmakers in the meantime, only to be told that the car needs a lot of work and that it was not worth it. 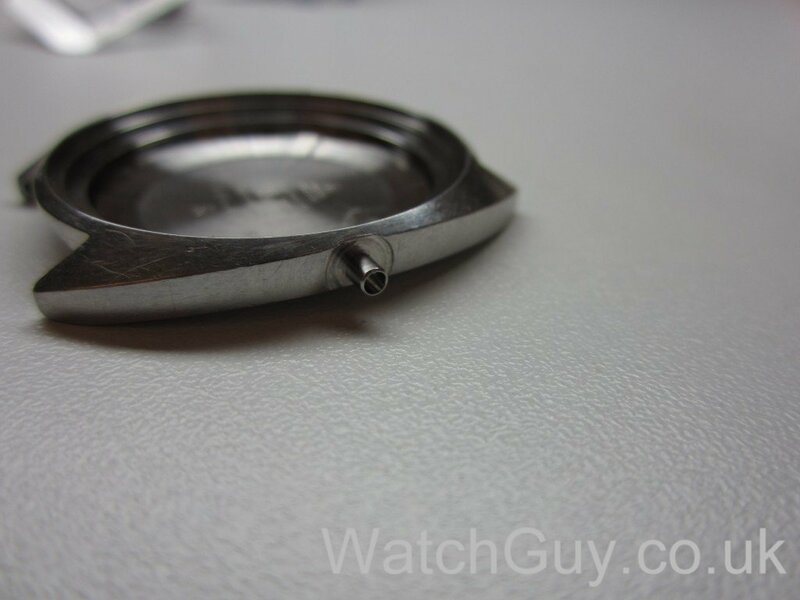 In fact one of them even told me that the watch had a 1-piece stem instead of the proprietary 2-piece that this watch requires. Christian of course confirmed that this was not the case! To make a long story short, I want to say a big thank you to Christian for reviving the little guy. 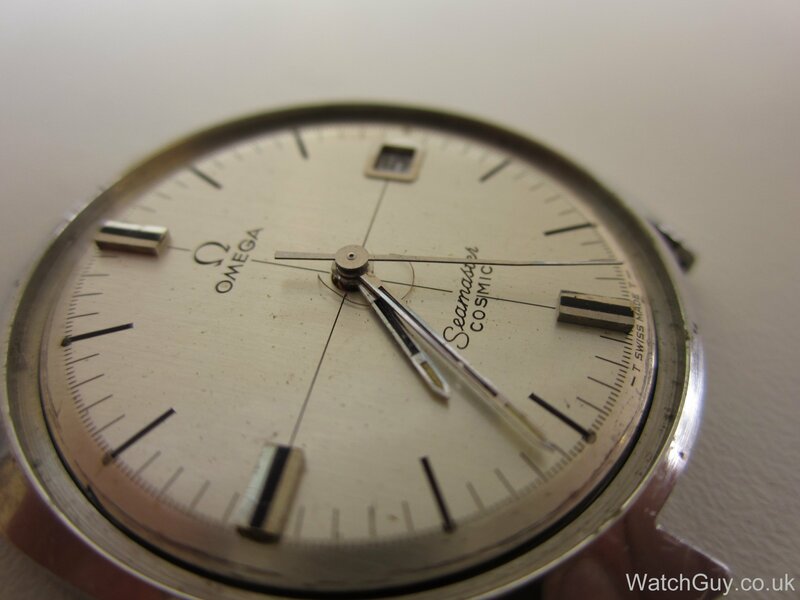 It might not be a family heirloom, or the most expensive watch out there, but it already holds a special place in my heart as it is my first Omega and my first Seamaster. Great website I love the high resolution images. 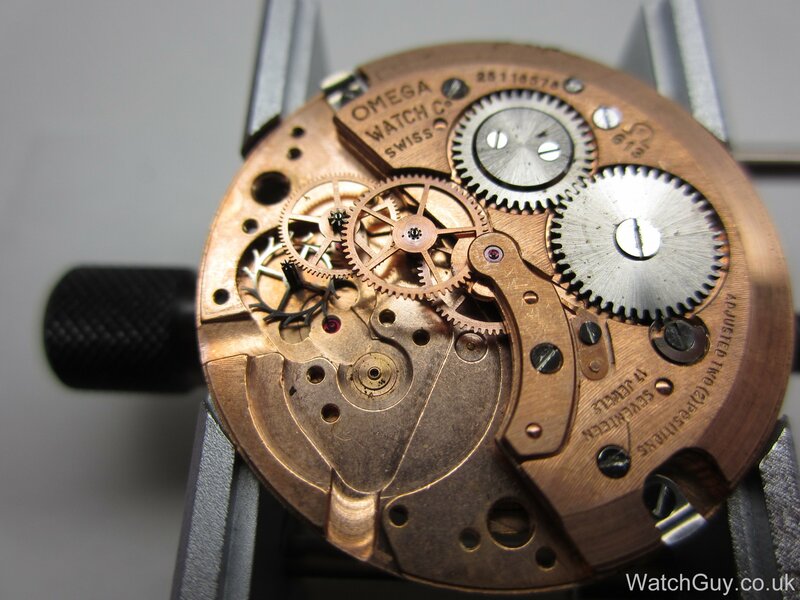 Would you be able to share where to find oiling instructions for the Omega 613 movement ? For standard movements, I follow the BHI guidelines on oiling. Also, I use Moebius HP oils instead of the standard D5. Thanks Christian. Good to know! Hi Christian! Another great post. I was wondering if the new crown tube was simply pressed into the case or did you secure it with some adhesive. Never done this before and am curious if press fitting will keep water out. Thanks! The tube is indeed just pressed in, and waterproof. It was just that the tube I got was too big to be pressed in. After taking off a tiny bit, I could press it in, and still needed considerable force doing so. That scratch on the date wheel is a puzzler… cant imagine anything that was impinging on the wheel hard enough to mark it like that wouldn’t have stopped it from turning? Like a bent seconds hand?? For the full 31 days?! You’s hope the previous owner would have stopped wearing/winding it! Good point – it’s a miracle to me, I have to admit. It would take considerable power, so I would expect the watch to grind to a halt, rather than scratching the date wheel. On the other hand, you can’t do this manually… So maybe there was something stuck, and somebody forced the quick-set through almost a whole month??? On a second thought, and looking at the photo of the date wheel again. 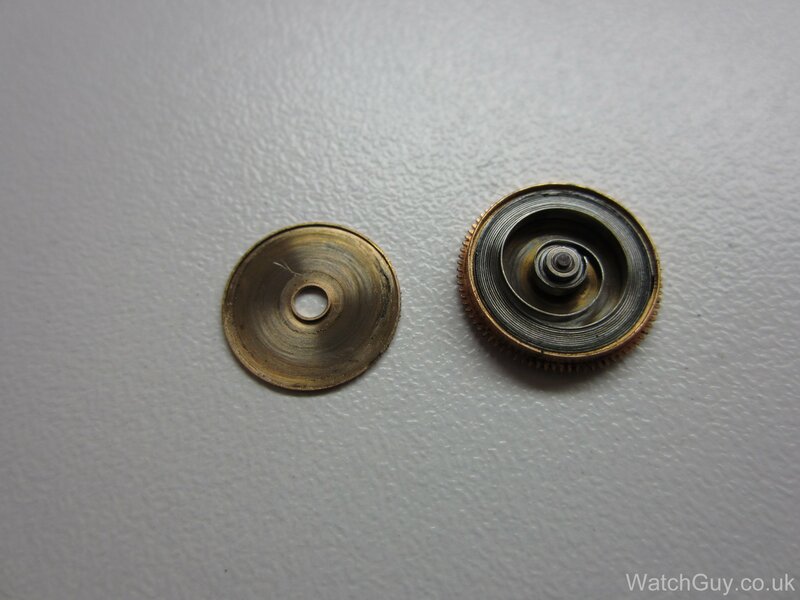 Something small being stuck, and bearing down on the date wheel, and very slowly, over a couple of months’ time, grinding that little groove into the dial… that sounds the most plausible. IIRC these are a quick-set date so if the ‘something’ was stuck south of the date window, you could click through the whole month before you saw the damage you were doing to the date wheel. Good point – and probably how it happened! 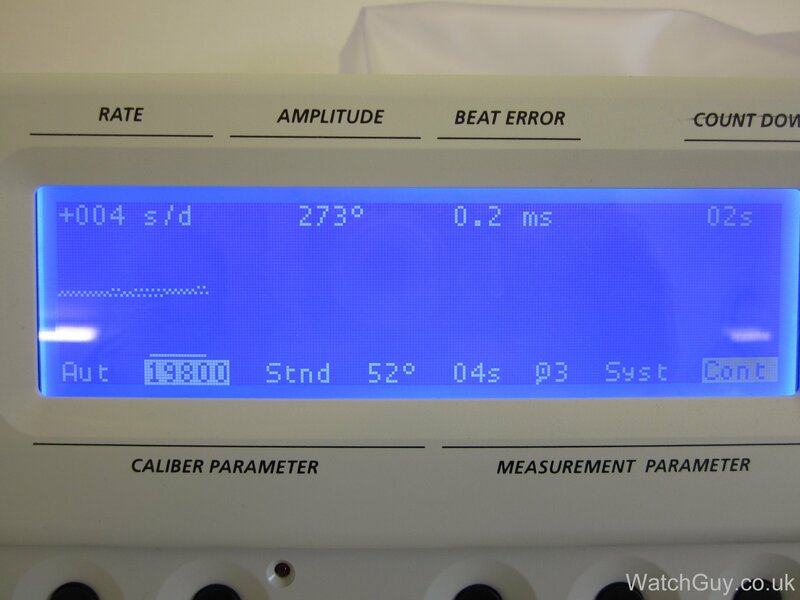 I have seen something similar happen before, however with a sub second hand…. At least it looks fantastic now!